Family Friendly Although summiting Deer Mountain might not be doable by every visitor, it's certainly the most attainable prominent peak in the park. Summit elevation 10,013'. A rugged hike featuring sweeping views that climbs to the summit of Deer Mountain. Although this hike does have a gradually more challenging ascent, the views more than compensate for the work to get to the summit. This is one of the more popular hikes in the park as the views from the summit of Deer Mountain are definitely worth the climb to the top. The six-mile round trip hike to the 10,013 ft. summit is a very doable hike for most people. Starting from the Deer Mountain Trailhead, begin on the Deer Mountain Trail. Stay right at the first junction which is shortly after the trailhead where the North Deer Mountain Trail branches to your left. The next junction will be approximately three miles in where you'll want to take a right onto the Deer Mountain Summit Spur which leads to the summit. Given the amount of elevation change that occurs along this trail, there are some tight and steep switchbacks to navigate. 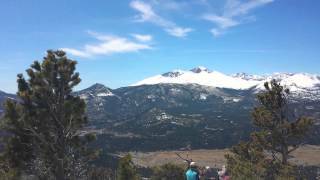 The views of the surrounding mountains are spectacular along many portions of this trail - especially from the summit where you'll have a 360-degree view of the surrounding peaks of the Continental Divide, Estes Park, and Moraine Park. Snow packed but only needed spikes to keep from slipping. Woof. That was fun for a first CO hike. Beautiful scenery at the top! The spur to the summit was untrackable in the snow. Great hike. Image of the Fern Lake Fire.